Jeremy Hunziker hails to O’Gara La Jolla from the East Coast. He moved to California five years ago after circumnavigating the globe prior to college graduation. 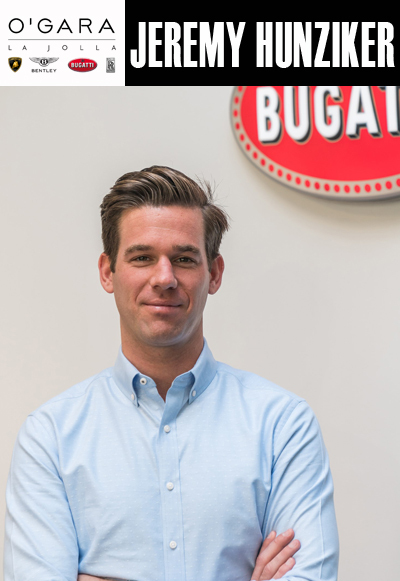 An avid motor sport enthusiast, Jeremy jumped at the opportunity to work for O’Gara La Jolla as its fulfilled his dream to work within the exotic automotive industry and representing such prestigious brands: Bentley, Bugatti, Rolls-Royce and Lamborghini. He loves the ocean and goes diving and surfing often during the summer and winter months. He is also a passionate content creator and is often found with camera in hand. His favorite supercar currently is the Lamborghini Aventador S which he describes as being the pinnacle of your everyday supercar form and function. Jeremy brings forth very positive energy to his team and turns every encounter to an uplifting experience with his contagious attitude towards life.